The email exporter software is capable to to convert the data items from multiple versions of MS Exchange database files. Also, the items of Exchange mailbox and public folder of the Exchange server would be possible to convert to supported file format. 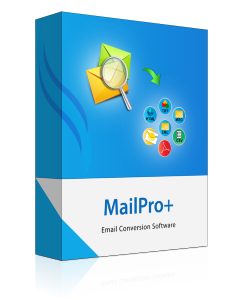 The software provides one fantastic feature where users are free to convert the multiple emails from MBOX files on any platform such as: Apple Mail, Google Takeout, Mozila Thunderbird, Entourage, Turnpike, etc. As the email exporter tool scans and loads the selected data files, it will display the entire items or folders in it. In addition, it facilitates to check the folders or the items which you wish to convert. Is it required to have some other applications installed for the proper working of the tool? MailPro+ is a standalone application and does not require installation of any other application for its normal working. Can I recover deleted emails from PST files using this utility? On scanning the files, the tool recovers deleted emails from the files which can be converted into desired format. "I must appreciate the efforts that have been put by the Development Team for designing this Expert Utility. The tool works magnificently without any data loss. The interface of the tool is simple and can be easily executed without any guidance. Well done and keep going."